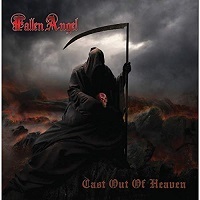 FALLEN ANGEL are a Heavy Metal band founded in 1984 that call Upstate New York home. The band have undertaken quite an impressive task, as they are in the process of releasing not only an epic trilogy of music releases, but a trilogy of albums that are also accompanied with a novel for each release. The novels are written by band founder and lead guitarist John Cruppe. “Cast Out of Heaven” is the second installment of the trilogy, and follows “Crawling Out of Hell”. Upon learning the details of this album and how it relates to the previous and forthcoming albums, I was concerned that I might be somewhat lost in the context. Nothing was further from the case. I found that “Cast Out of Heaven” stood boldly as its own entity, though I am very inclined to seek out the first volume as well as the accompanying novels in order to experience this saga as a whole. I love an adventurous concept album, as well as being an avid reader. So in theory, this checks off all the boxes for me. So, does the music live up to its lofty expectations? Let’s dive in and see. As mentioned previously, FALLEN ANGEL identifies themselves as a Heavy Metal band. No argument. But to take that description a bit further, I’d label them as a NWOBHM meets Thrash with a sliver of Prog and AOR sensibility, but with more of an 80’s Power Metal feel. Think METAL CHURCH or even GRIM REAPER for musical reference, and definitely HALLOWEEN, KING DIAMOND and LIZZY BORDEN for theatrics. Whatever you ultimately want to call it, it’s hits you hard, fast and right between the eyes. The dual guitar attack of Cruppe and Dipinto is seemingly never ending, intense and precise in its assault. Embury’s six string bass comes through as a lower scale lead throughout, but it’s low rumbles really shine on a track like “Lord of the Flesh”, which was one of my favorite tracks overall. Vocally Steve Seniuk is covering all the bases on “Cast Out of Heaven”. From the shrill air raid sirens of “The Burning Curse” the Di’Anno like recitation of “The Fall of a Lord” to the haunting whispers of the aforementioned “Lord of the Flesh” and “Dance of the Dead”, Seniuk hits a homerun throughout. Finally, the phenomenal percussion work of Frankie Quaggs cannot be ignored. Some of the best overall kit work I’ve heard in some time. All these talents really come together on tracks like "Withered Souls" and "The Man In Black". With 19 tracks and clocking in at some 70 minutes long, “Cast Out of Heaven” takes some serious investment as a listener, but manages to pay off with quite a reward. Each song managed to surprise me in some form or fashion with some clever timing change or memorable hook. FALLEN ANGEL have rendered a fine submission here for those willing to invest some time. Whether as part of the entire sage or as a stand alone album, “Cast Out of Heaven” a damn strong release.